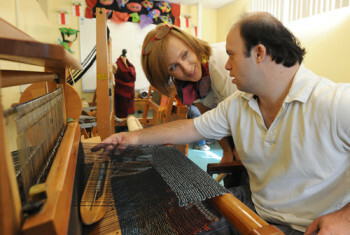 Give BIG on Tuesday, May 6 to help St. Madeleine’s support over 400 adults with development disabilities! St. Madeleine Sophie’s Center is honored to participate in giveBIG San Diego 2014. On Tuesday, May 6, we will be partnering with The San Diego Foundation to recognize and support the positive work of 300 + nonprofits in the San Diego community. GiveBIG is an online networking and giving event where nonprofits have the opportunity to gain exposure while bringing people in the San Diego region together to raise as much money as possible for local nonprofits in a time-sensitive period. For detailed information on giveBIG CLICK HERE. Donors choose their donation amount, with a minimum gift starting at $25. There is no limit as to how much a donor may give to a nonprofit, but only the first $1,000 of every gift will be counted towards incentive pool funds. The San Diego Foundation and other sponsors have committed $200,000 to incentivize giving during this event, so that nonprofits will receive a proportion of this pool based on how much money they raise during the event. For example, if St. Madeleine’s raises 5% of the total amount raised during the event, St. Madeleine’s will receive 5% of the incentive pool. GiveBIG is a great way to increase the value of your donation. Every dollar raised helps St. Madeleine’s to continue to provide quality, unique day programs and services to over 400 adults with developmental disabilities year round. Please support St. Madeleine’s by participating in giveBIG on Tuesday, May 6!